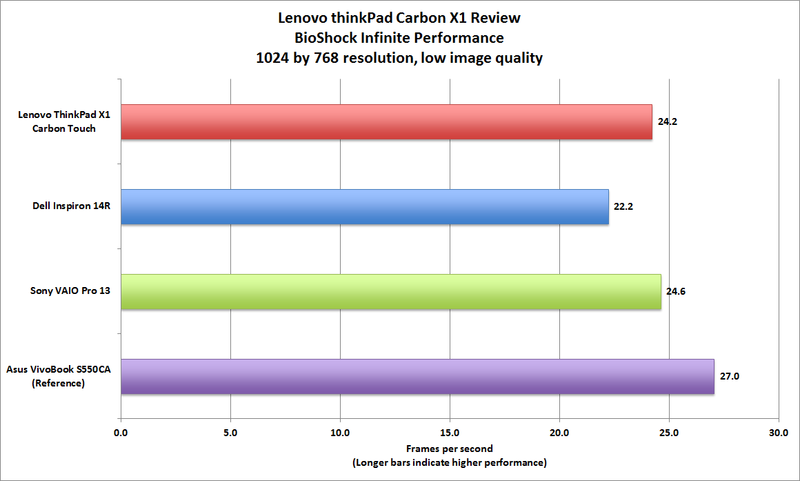 Note: This review is of the X1 Carbon Touch that Lenovo shipped in 2013. If you're looking for our review of the all-new 2014 model, you'll find it here. ThinkPads have been a class act among business laptops since IBM launched the line over two decades ago. As a Lenovo brand, they remain pricey, but they’re also exceptionally easy to carry and comfortable to use. 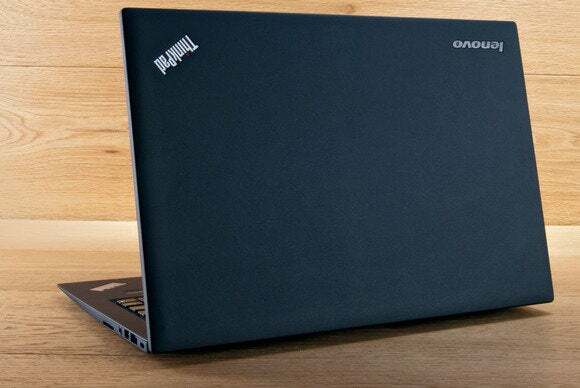 The ThinkPad X1 Carbon Touch stands out even from its forebears. I recently took this Windows 8 Pro model with me on a flight from San Francisco to the East Coast and quickly fell into serious like with it. Fabricated from carbon fiber, it’s one of the thinnest and lightest 14-inch Ultrabooks around, and I found its low-glare touchscreen big enough to view spreadsheets without stressing my wrists and fingertips while panning and scrolling. The display was easy to read even in the constantly changing lighting conditions inside the aircraft’s cabin. 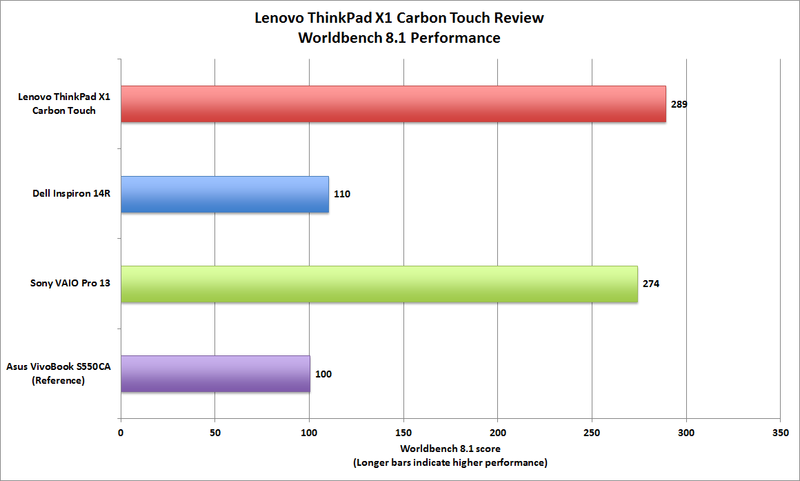 The wafer-thin ThinkPad X1 Carbon Touch weighs just 3.4 pounds. The X1 Carbon Touch comes with other intelligent design elements, too: A perfectly tensioned screen panel that I could quickly flip open to the exact viewing angle I wanted; a quiet, cushy keyboard that’s a pure joy to type on; a large, smooth glass multitouch trackpad with excellent palm rejection to minimize fly-away cursors while I typed; and a case that’s tough and stiff, yet soft enough I could comfortably perch my palms on the keyboard deck for long stretches while I pounded out notes for this review. I do have a few complaints. My biggest beef is the short battery life. I flipped open the X1 Carbon Touch soon after we lifted off from SFO, and it expired more than an hour from Boston. I’m used to getting to New England with juice to spare. I have a few other gripes, which I’ll mention later. 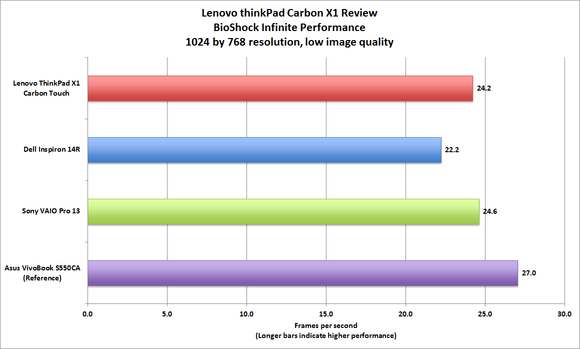 All in all, though, the X1 Carbon Touch is a terrific machine. It’s one of the most comfortable and easiest-to-use notebooks I’ve laid eyes and hands on, and it’s amazingly tough for such a thin and light model. If all you’re after is speed and feeds, you can find much of what the X1 Carbon Touch offers in machines costing hundreds of dollars less. Its most exciting silicon is the lightning-fast 180GB SSD that gave it the edge in our performance tests (more on that below). The processor (Intel’s 1.8GHz Core i5-3427U, with its HD Graphics 4000 integrated GPU) and the 4GB of memory are standard fare on small notebooks, and you can’t upgrade either. Not that you'll be playing a lot of games on the company's notebook, but it's good to know the X1 Carbon Touch can keep up with the competition on that metric. The Carbon Touch shines—truly shines—when you take it with you and actually use the thing. It’s so light and slim I hardly noticed it in my carry-on bag. It weighs only 3.4 pounds and measures 0.75 inches thick. Still, this ThinkPad hardly flexed at all when I gripped its ends with both hands and gave it the torque-twist test. Getting down to business with the X1 Carbon Touch is an almost unbridled pleasure. The screen panel slightly overhangs the keyboard deck; that, plus the slightly tacky, almost rubbery case surface makes the laptop easy to grip and flip open, and it almost instantly wakes up from Sleep mode. Even from a dead start, the Carbon Touch fires up in 10 seconds, among the fastest full boots we’ve seen among little notebooks. The 14-inch screen is based TN (twisted nematic) technology, so colors are less vivid, and viewing angles aren't as wide compared with an IPS (in-plane switching) display, but the viewing angles are exceptionally good for a TN panel, even from the top or the bottom. The screen resolution of 1600 by 900 pixels is a good match for the display’s size. You'd never guess that the X1 Carbon Touch's display is based on what's widely considered to be inferior twisted-nematic technology. And that brings me to input, one of this ThinkPad’s greatest strengths. You won’t find anything better on any computer this small. The display responds nimbly and accurately to touch gestures, and so does the touchpad. The keyboard is hands-down the best I’ve used on any notebook under 4 pounds. Lenovo spaced the keys an eighth-inch apart (only slightly less than the gaps you find on full-sized keyboards), the keys are slightly concave from side by side, they have the same slightly tacky surface you find on the case, and the tactile feedback is spot-on. The end result: I cranked out loads of typo-free copy even while wedged into my window seat on the 737. Plus, the keyboard is so quiet, it has almost no clacking sound to it at all. This ThinkPad comes with two pointing devices: the eraser-head-like TrackPoint nestled within the keyboard keys, and the trackpad below the keyboard. The TrackPoint’s big benefit is that you don’t need to move your hands off the keyboard to use it. Touch-typists will love it, but I found the TrackPoint overly sensitive. Your mileage may vary. I could do multitouch gestures on it like pinching to zoom, so I didn’t have to move my hands up to the screen very often, and I worked blissfully free of flyaway pointer problems—the first notebook I’ve reviewed with that perfect record. The touchpad, though, is a little finicky when I tap on it to mimic left-mouse key actions. The X1 Carbon Touch has some great usability features, such as the dedicated buttons underneath the screen for adjusting the volume and muting the onboard mic. These are very handy when making video calls. The speakers themselves are mounted near the front of the PC, beneath the keyboard deck. The bottom edges of the laptop slope up, so the sound bounces off whatever surface the computer is resting on. That’s fine if it’s a desktop or table, but it can sound muffled if the PC’s sitting on a soft surface like a seat cushion (although that’s not a good practice anyway, since that could block the cooling vent). So where could Lenovo most improve this ThinkPad? Battery life and expandability. Our battery-rundown test puts battery life at 4 hours, 9 minutes, but it seemed even less in my day-to-day use. A saving grace: The battery recharges really fast. I charged it to 75 percent in 30 minutes, which is great even if you have tight flight connections. Bring a portable battery charger with you on long trips. The X1 Carbon Touch's battery poops out much too early. The X1 Carbon Touch also has fewer connections than I expect: just two USB ports (one 2.0 and one 3.0), a mini DisplayPort, an SD Card slot, and a headset/mic jack. You can use the USB 2.0 connector to charge a tablet or smartphone even when the computer is powered down. You get no ethernet port, so it’s good that Lenovo provides an ethernet dongle, but that’s something extra to remember to pack—and possibly lose. Lenovo also sells a VGA dongle for $35, if you really need one. I also found a SIM card slot on the back of the notebook for mobile broadband. But you’ll need to buy a 3G card and make sure that the needed WWAN (wireless wide-area network) antennas are installed inside the computer. As is often the case with superthin notebooks, hardware upgrades are limited and a pain to accomplish. Your IT department might love the X1 Carbon Touch less than you. The Core i5 processor and the 4GB of memory, for example, are fixed. Apart from adding a WWAN card, you can bump up only the size of the SSD. 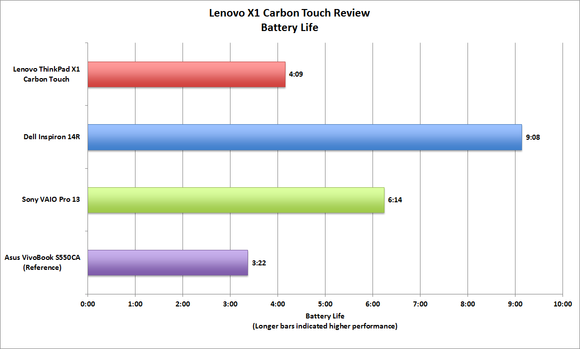 The X1 Carbon Touch performs quite well compared to its ultraportable peers. Thanks to its superfast SSD, it chalked up a 289 on our WorldBench 8.1 score, beating out nearly all its Core i5-based challengers and even some Core i7-based notebooks. As for real-time gaming, this ThinkPad plays them better than most small notebooks, but it’s still nothing to tweet about. Running BioShock Infinite at a resolution of just 1024 by 768 and with image quality set to low, the Carbon Touch delivered only 24 frames per second. That’s not awful, but it’s less than the 30 fps threshold you need to have a great experience. You’ll want to keep the ThinkPad X1 Carbon's AC power brick close at hand, which will raise your carrying weight to 4.2 pounds. Apart from that and the too few connectors, it's a truly great notebook. It costs a pretty penny, and its performance won’t knock your argyle socks off, but it delivers enough power to cruise through all your typical business tasks, it’s tough as nails, and it’s an eminently easy machine to carry around and use. If you travel for work, those are the things that really matter.